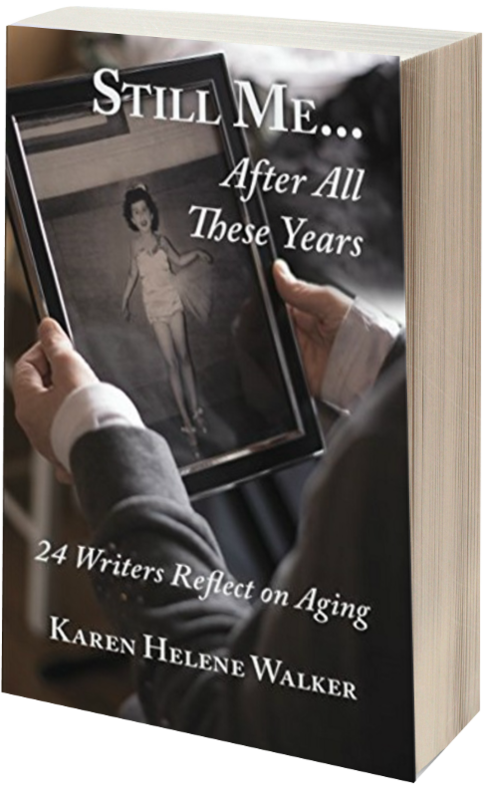 It’s a pleasure to be participating in the Blog Tour for STILL ME … AFTER ALL THESE YEARS: 24 Authors Reflect on Aging by Karen Helene Walker through MC Book Tours. This is a charming, funny, and enlightening collection of essays about aging. In addition, Karen is offering a tour-wide giveaway featuring two (2) print copies (U.S. entries only) of STILL ME and two (2) eBook copies of STILL ME (International entries). See how you can enter to win below. STILL ME is available at the following sites: Amazon (print and Kindle), Barnes and Noble, Kobo, and iTunes. Be sure to add it to your shelf on Goodreads. "Karen Walker happened to post her call for submissions at precisely the moment I had made a major decision. During the months just prior, I had formally retired, published my first novel with the second due out in May, and was casting about for an entirely new arena from which to write my third. No longer bound by family -- my sons now out in the world -- or jobs, I would do what I had longed to: live in Europe. Giddy with the possibility, research revealed Portugal as viable. I had never been there, but I have solved that. I am on a reconnaissance mission as I write this. Viable may become likely. And so, when Karen's request for forward-facing, optimistic pieces on the up-side to being this age came in, I couldn't resist sharing my enthusiasm." Rev. Clara Alexander is an ordained New Thought minister who creates and performs sacred ceremonies, including unique weddings, funerals, memorial services, baby blessings and house blessings. She is also a popular speaker, inspiring groups with her talks on how we cling to our grudges, how we overuse the phrase “I’m sorry” and how we can live the life we love. Wendy Brown recently retired from a career in wildlife biology, where she studied sandhill cranes and whooping cranes as they migrated from Idaho to New Mexico. Wendy eventually found a permanent home in Albuquerque, where she and her husband enjoy the sounds of sandhill cranes from their deck. Since retiring from state government in 2014. Pat Garcia (Patricia Anne Pierce-Garcia Schaack) is an American expatriate living in Europe. An accomplished musician as well as a writer, she has been writing (and reading) since childhood. Holly Deuel Gilster plays “make believe” for a living. In other words, she is a professional actress and musician. Holly also loves painting with words as an accomplished poet, an award-winning short-story writer and a book reviewer for The Or Echo. Aaron Gordon is a retired social sciences community college professor. He and his wife, Ellie, have been married for 65 years and have three children and grandchildren. Ellie Gordon is a retired public school teacher who spent the best 20 years of her life in the classroom. A Chicago native, she now lives in New Mexico. Karla “Rosie” Harper recently retired from teaching elementary school, freeing her to return to her early love of dancing. Today, when not helping out with her grandchildren, Rosie is taking dance lessons, spinning on a dance floor or performing in senior centers and retirement communities with Albuquerque’s Sugartime, as a singer as well as a dancer. Karen Norstad has worked as cashier/gift wrapper, secretary, boutique seamstress, administrative assistant, manager of employee stock options, executive assistant, and budget analyst. Now retired, Karen’s life revolves around lounging about, wearing PJs until four in the afternoon, obsessing over the news, reading, fusing and slumping glass, practicing piano, keeping a small balcony garden and cooking. Matt Nyman’s nonlinear career path has included working in the geological sciences, teaching high school, stay-at-home parenting and, currently, training tomorrow’s teachers. Poetry equently resides near the surface of his existence, occasionally erupting onto paper. Jill Plaman was born and began aging in Milwaukee, but she has lived and worked in Albuquerque since 1977. She holds a BS from the University of Wisconsin-Milwaukee and an MSW from the University of Minnesota. Her special interests are travel, international folk dancing, reading, hiking and spending time with family and friends. Maureen Polikoff is a clinical social worker/ therapist who has always pursued many other creative endeavors, including painting, playing music and, now, writing. A Connecticut native, she lives in New Mexico with her husband, Michael. MaryFrank Sanborn left Boston 33 years ago, to apprentice with photographer Walter Chappell in Santa Fe. Still in love with the beauty of the Southwest, MaryFrank photographs, writes, hikes, travels, teaches yoga and meditation, makes soups on Sundays, and dreams of the ocean and whales. You can follow Karen and the other authors along on their tour by checking out the schedule HERE. 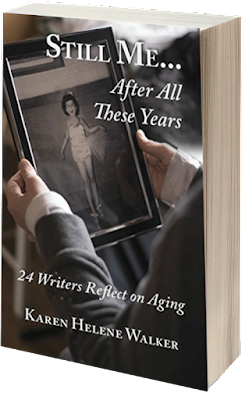 This tour-wide giveaway is for two (2) print copies (U.S. entries only) and two (2) eBook copies of STILL ME … AFTER ALL THESE YEARS: 24 Authors Reflect on Aging. The giveaway will end at 12 a.m. (EST) on Tuesday, April 4. To enter, click on the Rafflecopter widget below and follow the instructions. The widget may take a few seconds to load so please be patient. Thanks for stopping by today. Be sure to check out this charming book. Sounds like it was perfect timing for most of the contributing authors. E.V. makes me feel aging can have wonderful benefits. Nick, thanks so much for being a part of the tour. Thank you so much for participating in the blog tour, and good luck E.V. I just know you're going to love Portugal. My next move is Italy. That's where my heart is and I can't wait for the journey there to begin. What a nice idea for a book! Best of luck to the authors and editors! Hi Nick. Thanks so much for hosting E.V.today and participating in our blog tour. E.V's essay made me so happy when I read it. And now I'm even happier since Ill have a friend to visit when I finally get to Portugal some day! Thanks, Nick, for being a part of this Blog Tour. It is great to meet you! The best thing about Blog Tours is getting to know new people. My husband is from London and I, too, write short stories so we are somewhat kindred spirits. It sounds like you are on an adventure yourself. Three girls and five dogs, oh, my. You are a busy man. I'll come back and visit from time-to-time. I'm glad to see your book "Overcoming Adversity" is available in Kindle format. Our house is too small for all the books I want to read, so my husband gave me a Kindle and "strongly suggested" I get rid of a few hundred of my hardback and paperback books. I'm so excited about this book...and not just because my mom is one of the authors! I'd be intrigued anyway. It's such an interesting premise. Young people seem to think that once we reach a "certain age" our days of excitement are behind us. Along with many others, E.V. is proving them wrong. I wish her much excitement and happiness in her courageous move. Thanks so much for hosting E.V. 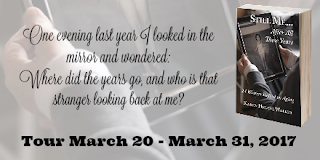 and for being part of the Still Me blog Tour. This is everywhere! What a great premise! I love the premise of this anthology! I saw this book featured on another blog. I bet it has some interesting stories and thoughts on aging. Love the theme behind this anthology. Many congrats to all the writers involved! I know this will be a great collection of stories. I entered. Fantastic! Congratulations to all the authors. I love the idea behind this anthology. I'm sure it will be very successful. Sounds like a great collection. Thanks so much for spotlighting it, Nick. This sounds like a good read to get my dad's girlfriend. Thanks for sharing about it.